If you are looking for a birthday cake for your child, I am sure that many of you opt for a black forest cake. This is a cake that liked by most children due to its flavor, deliciousness and supreme color decorated with cream and chocolate. Some of my friends requested the cake recipe. 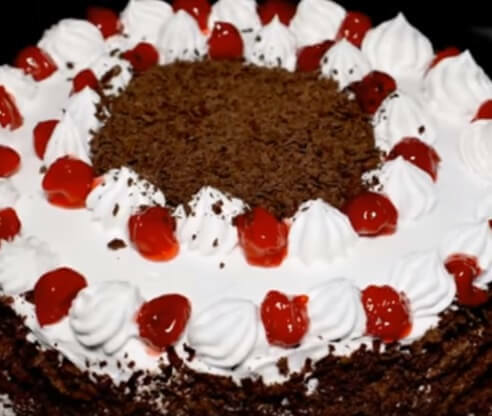 Here is the best black forest cake for my cake lover friends. You can make the black forest cake in different ways and be adding different ingredients. But here in this recipe, I tried to give a simple recipe for it. First, the chocolate sponge cake is to be baked. I prefer to bake one piece of thick sponge cake and then slice it into three layers. You can also bake two or three layers in separate pans. Then I used pastry cream and butter cream. 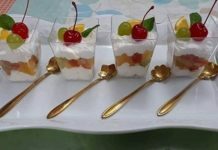 Ingredients and process of these two types of cream are also given in this recipe. Put egg and sugar in an oil-free bowl. Put the bowl in a hot boiling pot. Now beat the egg and sugar mixture with hand whisker until the mixture becomes hot. Then take out the bowl and beat with egg beater until the mixture becomes floppy and double the original size. Mix flour, cocoa powder, baking powder, and chocolate powder altogether and sieve with a sifter. Add the flour mixture to the egg mixture. Take a round shape cake tin and grease with butter or oil. Put a paper in the cake tin. Pour the mixture into the cake tin. Preheat the oven to 180⁰c for 10 minutes. Bake the cake at 180⁰c for 30-35 minutes. When baking is complete take out the tray. For checking the cake put your hand on the cake, when you will see there is no hand print on the cake, then the cake is perfect. Boil water and sugar. 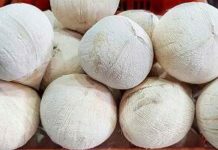 Mix milk powder, corn flour, and egg with 100 ml water. Add the mixture to the boiled water slowly. When the mixture becomes thick, take out the mixture from the burner. Add butter and vanilla essence to the mixture. Pastry cream is ready to use. Beat all ingredients with egg beater until a floppy cream is formed. Cut the baked cake into three slices. Brush with coke or Pepsi on both slices of the cake slices. Mix half butter cream and pastry cream altogether until the mixture looks like fresh cream. Add smooth fruit jam and mix well with the cream mixture. Put the mixture (butter cream +pastry cream + jam) over the first layer of the cake slice, spread pieces of cherry over the cream and put another layer of the cake slice. Use the same process with another slice of the cake. In the top layer apply butter cream and put the cake into the refrigerator for 30 minutes. It will be better if you make the cake one day before you serve it. 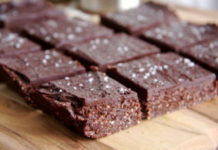 Decorate with cherry, cake crumb, or grated chocolate as you or your children like. The best black forest cake ie ready to represent. 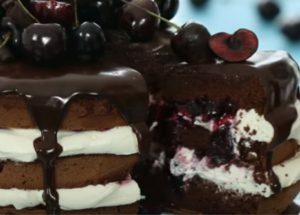 If you like my the best black forest cake recipe please share the recipe with your family and friends.